May I respond to Councillor Peter Price’s letter, (Your View, December 20), and challenge some of the claims he made regarding the tree issue and work on the Highways. Unsurprisingly Councillor Price attempts to justify the disgraceful and totally unnecessary massacre of Sheffield’s street trees and congratulates Amey, Streets Ahead and Sheffield City Council for “the magnificent job they have done over the past five years in transforming the highways throughout our city”. Well, roads in every neighbourhood have been detrimentally changed for ever with the loss of so many beautiful mature trees. The claim that only dead, diseased, dying or dangerous trees have been removed (which the campaigners do not have a problem with) is false, as most of those felled were healthy specimens which could have been saved using the engineering solutions incorporated in the Amey contract to address any problems of damage to footpaths. However these methods were ignored. As for some trees being “discriminatory” (creating difficulties for the elderly and disabled etc) well I haven’t noticed the same zealous action taken to remove cars that block access to pavements on every street in the city. 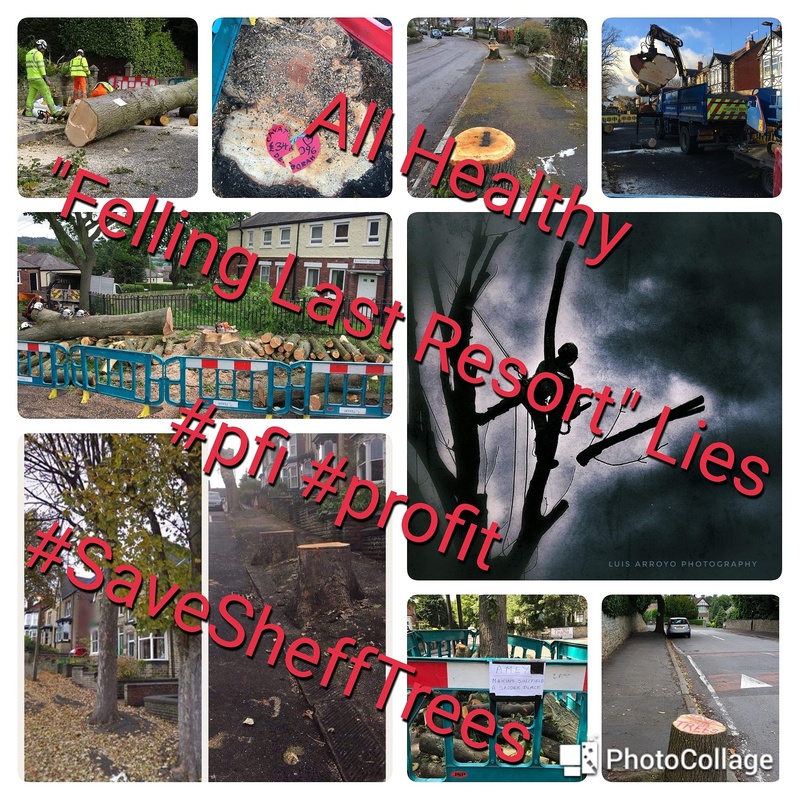 It is irrelevant how many new trees have been planted as they can never replace the mature ones with large canopy cover that we are losing and which are essential to counteract the dangerously high levels of pollution in Sheffield that is threatening people’s health and well-being. I would very much like to know how, after neglecting tree maintenance for so many years, the council propose to find the money to look after all the new trees they are planting. Perhaps Councillor Price can tell me how long I will have to wait to see the ‘replacement’ trees grow to the same height as those including ‘Delilah’ which once proudly stood on Rustlings Road, or why trees like the Vernon Oak are threatened merely because a kerb stone is slightly out of alignment? Maybe he can also tell me why perfectly healthy cherry trees on Abbeydale Park Rise that give such pleasure in spring with their blossom and enchant both children and adults with their fairy lights at Christmas are to be felled, or why memorial trees that were planted on Western Road to honour local soldiers killed in WWI are to be desecrated? (and no I don’t believe the wildly inflated figure that the council says it would cost to save them). It would take too long to mention all the roads across the city that are losing their stately mature trees, but their loss can only be described as a despicable act of insanity by those who have no concept of the importance of what they are destroying. Regarding the horrible new LED street lighting, I have heard motorists say they cast shadows in the wrong place and do not give as good light as the old ones. Many roads are already breaking up due and pavements are far more slippery and dangerous in icy weather than the original surfaces. So all in all, Councillor Price, I have nothing whatsoever complimentary to say about the highways work as it has brought nothing but untold stress and anxiety to residents and certainly hasn’t improved my quality of life. On the contrary I consider Amey, in conjunction with Sheffield City Council, have brought shame on our city with their environmental act of vandalism which has destroyed a precious part of our heritage and is one of the saddest episodes in our city’s history. In Doncaster we had a mayor called Davies nicknamed ‘the woodcutter’ who couldn’t see the horses running around the racecourse so cut down the trees of the golf course in the middle. Find the main instigator of this terrible deed (usually one person) and lynch em if you can find a tree left to to swing your rope over!